Our mission is to provide products that make your job easier. Steve Fujan, Licensed Professional Engineer, has been practicing mechanical engineering for 35 years. He has a Masters Degree in Mechanical Engineering, and provides engineering leadership for an international mobile equipment manufacturer. Steve's daughter plays the piano, and through this connection Steve has developed an interest in pianos and piano maintenance. Always looking to solve problems, he noticed many weaknesses in the tools we use to tune pianos. Please check out the WHY? 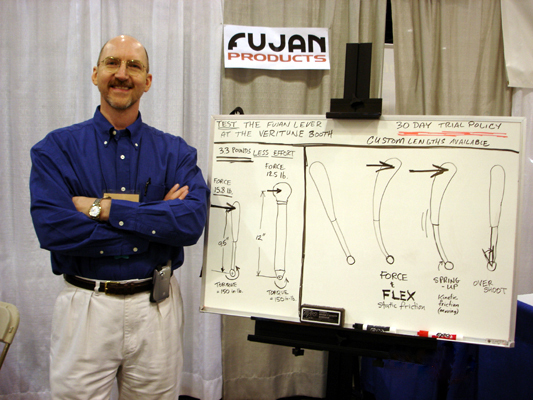 page to see some of the technical reasons Steve developed the CarbonTube piano tuning levers. Steve would like to acknowledge the efforts of his son Scott (a computer science graduate), who has been instrumental in making this website a reality. We hope you find it interesting and useful. If you would like additional information, please contact Steve by any of the methods listed below.